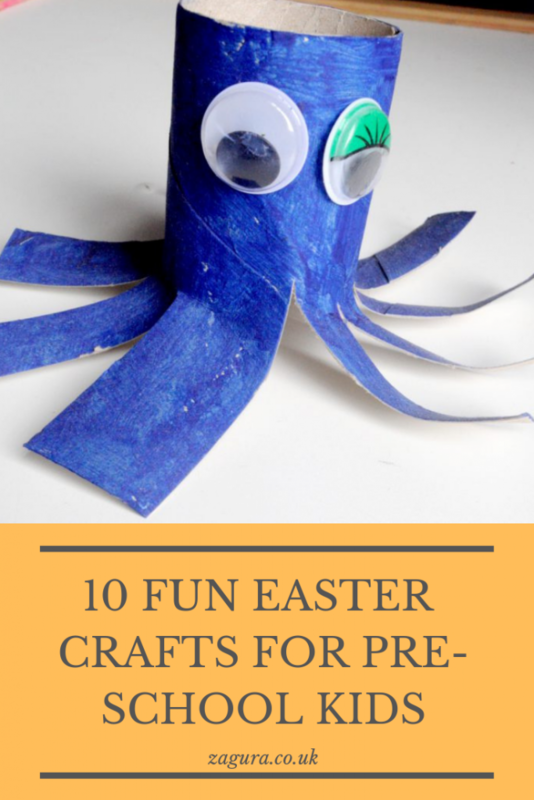 Easter is just around the corner and since the kids are on holiday, I find this to be the perfect time to do some art-and-craft activities these days. Though the weather is lovely and we plan to spend one of the days on a “whole day long” picnic, I also hope we will manage to do at least some of these 9 activities found on pinterest (by the way, you can also follow me on pinterest here). I know the photos says “10”, but one of the activities is not found but invented by me 2 years ago for my son and I thought my daughter might also enjoy it. The activities planned focus on some of the Easter symbols like bunnies, eggs and chicks. Let me start by describing the eggs-and-letters activity as this is the one I’ve already done and it is quite simple. All you need are a bag of plastic eggs (found it in a £1 type shop), a recycled egg carton and a pen. 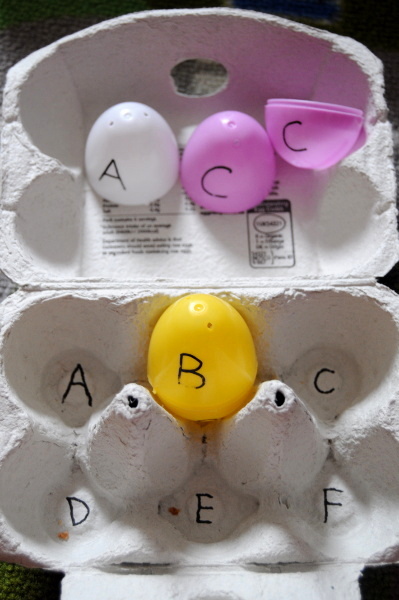 On each half of the plastic eggs write a letter of the alphabet (the same letter), and also white the same letter on the bottom of one of the egg cups. Do this for as many eggs as you wish. Then mix the egg halves and encourage the child to match them and then place the egg in the box on the corresponding letter. The activity is pretty simple for the parent to prepare, it is fun for the kid and it encourages the recognition of the alphabet letters (shapes) from an early age, before knowing the alphabet. The first activity I plan to do with the kids this week is called “Handprint Chick Puppets” as it’s way too cute! And quite fun and simple as it involves a yellow hand-print, some googly eyes and yellow feathers, some orange paper and a stick. You can find the full tutorial here – please let me know of the outcome in case you decide to do this craft too! Since we always have paper rolls around, I try to use them to their full potential. 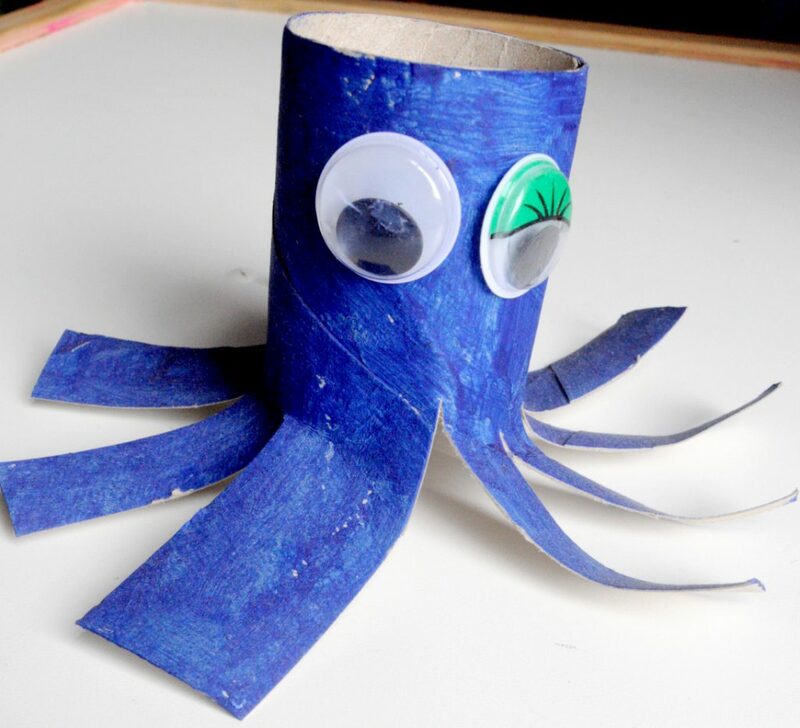 I even made a pencil stand with 4 compartments out of them (not good looking to be photographed but very useful) and lots of crafts with the kids, like the octopus below created by my son a while ago (the only photo of a paper roll craft I could find though). So, the plan is to once again use a paper roll to create some cute bunnies, inspired by this site here. Speaking of bunnies, we might also create some out of egg carton (source of inspiration) or Popsicle stick (found the idea here). And after getting out the Popsicle sticks I though we could use some of the to also create some cute chicks like those seen here. And if time permits we might also manage to do some sun-catchers (I love them!) and some Easter bunny corner bookmarks which are cute, very practical and a lovely present for friends. Oh, and it is a nice introduction into the world of Origami! So there you go, our art-and-craft plan for this week. What’s your plan?